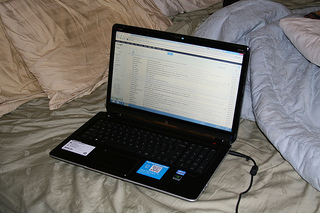 The new laptop we got for Christmas was really nice while were stuck in bed with the flu. The day after Christmas found us with two sick kids. It was a long night, but at least we made it until later on Christmas day before anyone felt really bad. Joe and Zofia started the round of illness with fevers, coughing and tummy-aches. Darren wasn't far behind, and was down for the count by the 27th. I managed to hold off another day or so, bringing everyone water and orange juice, before it got me. Flo was the only one that escaped the post holiday ick, but still had a sore throat and cold symptoms. We were quarantined for about five days, and were all getting cabin fever by the end. Thankfully, right before the New Year, we were all feeling mostly recovered, and ready to head into 2013 with renewed enthusiasm!